I once read someone describe war as 1% terror and 99% boredom. I’m not sure I agree with the percentage, but certainly a large amount of time is spent in the normal daily routine of cleaning, fixing, maintaining kit and eating. Resicast’s latest figure set fits well into the latter. Food, hereafter called ‘scoff’, is not only a necessity but scoff time offers a few minutes break from the daily routine, a time to socialise and enjoy a good meal. Soldiers need to eat a lot, given the large amount of energy that they burn up in their everyday activities. It’s also key to maintaining moral, just like receiving regular post is. It’s a moment in the day to look forward to and a missed scoff time is certain to raise a large amount of grumbling from the troops. This 3 figure set comes in the standard Resicast zip bag with a good quality colour picture to aid painting. Inside the bag are 4 more zip bags containing the 3 figures and a smaller zip bag holding the Mk II cooker and mess tins. Cast in a light grey resin I could find no fault with casting process and very little clean up will be required other than to remove some flash and the small pour stubs from the boots. As all three figures are wearing the same basic uniform I will deal briefly with that first. Each figure is shown wearing the tankers cold weather Pixie Suit seen in many photographs of the time in the North West European Campaign. Each uniform has the required number of pockets and the prominent seam/flap running down the length of the suit and trouser leg, with the hood attached to the collar. The collar straps are nicely depicted and also clearly shown, as are the cuff and lower leg fastenings. The upper left breast pencil pocket is in evidence and over all sculpted into what I would consider to be a very good representation of the kit worn. The only missing item I could see was the 3 small stitched holders above the top right hand trouser pocket, but as these are only just visible on the real garment I do not think their absence in 1/35 scale greatly affects the overall uniform. There may also have been slight differences in style if made by different manufacturers. The figure comes in 4 parts – the body being cast as a whole and the head and arms separate. Added to the Pixie suit this figure is wearing a 37 pattern belt, pistol ammo pouch and pistol holster hung forward just over the groin. The buckles on the belt are well cast and rear of the belt shows the two buckles that would hold the shoulder straps. He looks a little bow legged but I think this is as a result of his right leg being slightly forward and the seam of the Pixie suit. Around the neck of the Pixie suit is what appears to be a good representation of a camo scarf. The top two leg pockets of the Pixie suit look quite square, as if being filled out with documents/maps etc. It would have been nice to see the bottom of one of these pockets bulked out a little more. Both right and left arms are bent at the elbow in the eating process. In his right hand he is holding his eating utensil, I would say a fork, which has a small amount of scoff added to it. His left arm is also raised and is designed to hold the mess tin from which he is eating. There is a hole in this hand which I assume is to fit the mess tin handle through. The head shows the face of a fairly young man and he is wearing the standard tankers Beret complete with cap badge. His mouth is open ready to receive to-days offering. Apart from some very tiny bits of flash between his legs the only other clean up would be the removal of the to small pour stubs on his boots. Again the figure comes in 4 parts- this time the body is cast in the kneeling position with the left leg at 90% and the right tucked under his right thigh. Head and arms are separate items. He is wearing a 37n pattern belt with no side arm. Again the buckles are well cast both front and rear of the belt. This would seem a perfectly natural position when working over the Mk II cooker. He is also wearing a camo scarf wrapped around the neck, tucked into the pixie suit. His right arm is extended towards where the Mk II cooker would be, but this time the eating utensil comes as a separate item, a small spoon. His left arm is resting across his left knee, again a perfectly natural position. He also has the face of a fairly young man; there is a certain look of concentration on it, perhaps even a slightly serious tension about it. He too is wearing the standard tankers beret complete with cap badge. Again, with the exception of two small pour stubs on his left boot and right knee he should need little clean up. This figure also is shown eating while standing. He comes in 5 parts, with a whole body, his head, arms and right hand being separate items. He also wears a 37 pattern belt with no side arm and both the front and rear buckles are present on his belt. His left leg is bent slightly at the knee and positioned just behind the right leg, the heel of his left foot being raised slightly above ground level. I tried standing in this pose and it would be a little awkward unless your left heel was resting on a stone or slightly raised patch of ground. If that were the case then it would be a fairly comfortable stance. He too has quite prominent top side trouser pockets, but as the angle is slightly different and consequently so too are the pockets. His right arm comes bent at the elbow with the hand being a separate part. In his right hand he also holds his eating utensil; again a fork I believe, complete with a small tasty morsel. His left arm is also bent with a small gap between thumb and palm through which to feed the mess tin handle. The face shows that of an older, more mature man. Again, the mouth is slightly open in the act of scoffing and he too is wearing the standard tankers beret with cap badge. In the 4th small zip bag is the Mk II cooker and mess tins plus a short length of silver wire and a slightly longer thinner section of copper wire. The Mk II cooker comes in 4 parts with the base of the cooker nicely portrayed and sitting on top is a Dixie of food on the boil. Two side wind breakers are also included along with a small petrol gas bottle that fuelled the stove. This displays the gas pressure pump knob on one end and on top is what appears to be a small tap that controlled the burner setting. On the 1st example I looked at this tap appeared more towards the end of the bottle and in its place was a more rounded burner control feeding into the cooker. On the second example I looked at the fitting arrangement was slightly different so I must assume there were variations on this unit and therefore that there may have been slight differences in these controls. If in doubt consult your references. Along with the 4 main parts of the cooker you also get a handy wedge shaped jig to bend the copper wire to make the mess tin handles (see pics) The 3 mess tins are nicely done and to these you will need to add your own scoff as necessary. The thicker length of wire is to provide the pipe that leads from the fuel bottle into the cooker. The fuel cylinder was carried in the Mk II cooker, and could be used “freely” or attached to the front of the cooker. The pipe enters the cooker, through a small cut out featured on the front of the sliding front panel. A good reference picture of the Mk II cooker is on page 127 of Jean Bouchery’s The British Soldier Vol 1. I would say this is a very good representation of the collective stove issued to armoured troops and a very nice addition to British kit supplies. Overall, a very good set of British/Commonwealth tankers and, a first are far as I know in their activity. The casting is excellent and aside from the small stitched pocket above the right hand trouser pocket, I think this is an excellent representation of the cold weather Pixie suit. This is the first time I have seen troops with an Mk II cooker, so a very useful dio item there. Also adding realism to the scene, the mess tins are another new item I’m delighted to see. The small jig is also a useful and thoughtful addition to the set. Comment was made in the original news release about the two standing tankers looking very similar, but clearly their stance is different. What does make them similar is the set of their arms, both are right handed and eating in a similar way. I would have liked to have seen one as a leftie (no offence guys) for better variation. Also the way they are posed in the cover picture side by side, doesn’t help. There is clear difference in the facial features and I would guess that posed in a slightly different way they would clearly stand out as individuals. If further variation was needed then a change of head dress for one or two would probably be all that was needed to satisfy individual taste. The casting, as always with Resicast figures, is excellent and this is a new variation for them as I only remember one other set with Pixie suits and they were ¼ figures in their 35.510 set. The order of dress does limit their use to Autumn/Winter/early Spring 44/45, but I think they are a very welcome addition to the band of British Tankers now available. Clearly they could be used in a small stand alone scene or in a larger dio beside an armoured vehicle. 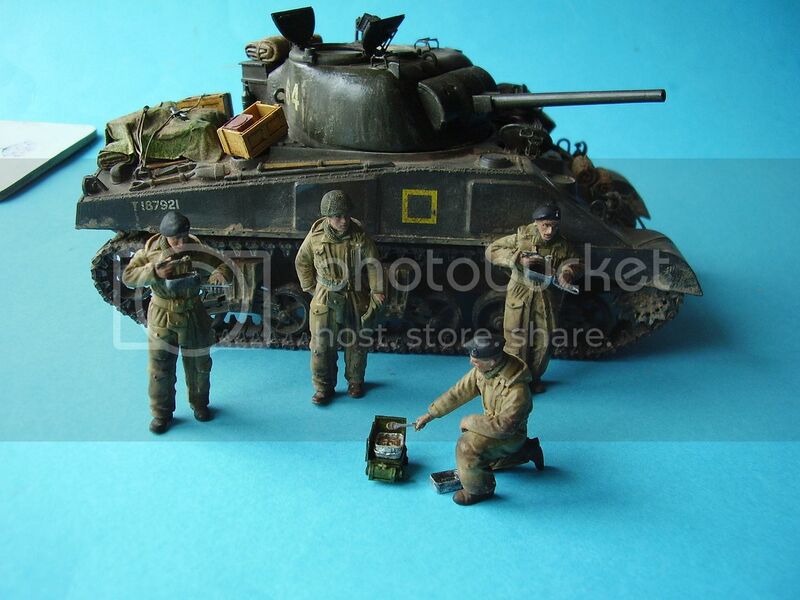 I am sure many will welcome this unusual set for the possibilities it offers both figure painters and armoured fans. The only things missing from my point of view are a couple of mugs for the tea, as you can’t have scoff with out a brew!! An open compo box and some tins would add to the scene. However, both compo boxes and biscuit tins are available and have been Reviewed Here, by Pat McGrath. I would very much like to see a similar set in BD that would fit with some of their existing figures for greater possibilities and use as infantry/armoured troops. Highs: Excellent casting and detail. 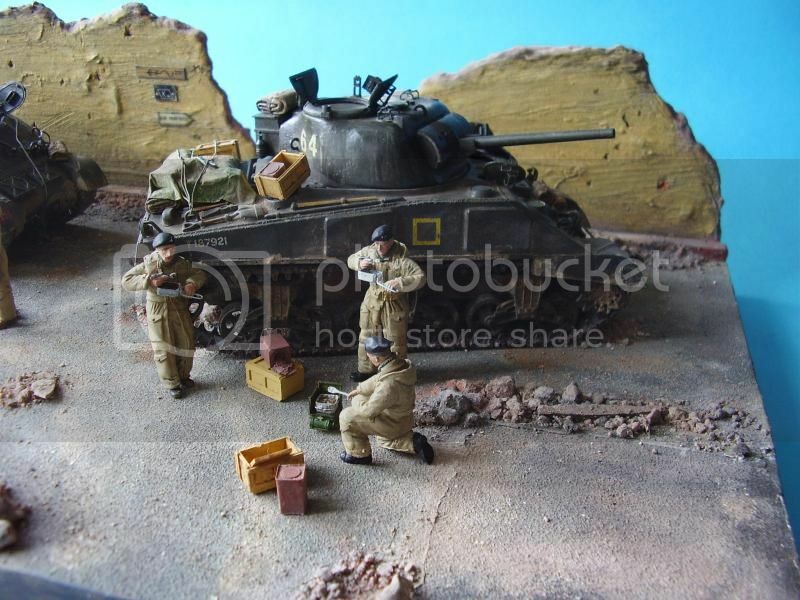 The set offers good possibilities for both figure painters and armoured modellers alike. The Mk II cooker and mess tins are also a first, I believe, and again useful items and very appropriate for the scene. Lows: Similar arm positions on the two standing figures, and similar head dress might put some less imaginative folks off. Verdict: Highly Recommended. A very useful additon for British and Commonwealth builders. Mostly true Darren but look at the first pic from the IWM on Al's post- no mugs in sight.. I can remember, while on exercise, eating whatever we had managed to concoct from our rations from our mess tins then washing it down with tea from the same mess tin. Mugs and cups are easy enough to scratch with a bit of sprue and some wire. My comment was made because being tankers there is usually hot water available inside british tanks for the purpose of some Char, however your replies have been taken on board and I can see your point. Only Us Brits would cooke on something called a Burner!